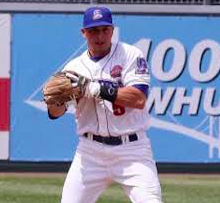 Pomona, NY – The Rockland Boulders announced Tuesday that the Miami Marlins have purchased the contract of infielder Junior Arrojo. Arrojo, 28, has spent the last three seasons with the Boulders and was a key contributor to their CanAm League championship team in 2014. During his time with the team, he hit 11 home runs with 111 RBI and set many team and CamAm League records. Last season, the shortstop set the Boulders record for single season batting average (.341) and stolen bases (47), as well as on base percentage (.483), which is also the current CanAm League record. Arrojo is also the Boulders career record holder for batting average (.313), walks (128), hit by pitches (89), career stolen bases (93) and on base percentage (.435). He holds the Can Am League records for single season HBP (36) set in 2015 and 2016 and single game HBP (4) set on July 6, 2014. Among his career highlights, is his dramatic solo home run in the bottom of the 8th inning in Game 4 of the 2016 playoffs vs. Quebec Capitales, which tied the game and allowed the Boulders to go on to win the series and advance to the CanAm League Championship. Scoring the winning run on a passed ball in game 4 of the 2014 championship series, allowed the Boulders to tie the series and eventually go on to win the championship. “While we hate to lose Junior, we are thrilled that he will be able to continue his pursuit of playing in the big leagues thanks to the Marlins,” said Shawn Reilly, Boulders EVP/ General Manager. “Junior thrilled us for three seasons with his wizardry in the field and prowess at the plate. As much as he was a fan favorite for his hard work and exciting play on the field, we will also miss him for his fan friendly attitude off the field. He is a class act and we wish him well,” Reilly said. A native of Miami Florida, Arrojo started his professional career in 2011 as a member of the Florence Freedom of the Frontier league. During his seven-year professional career, the middle infielder has also played for the Southern Maryland Blue Crabs, and for the Perth Heat of the Australian Baseball League. He is the 14th Boulders player to sign with major league organizations.